Sandy Feet At Brighton is only a 1min drive to North Beach at New Brighton in Christchurch. Completely refurbished and redecorated in late 2016, we are excited to offer our range of accommodation from backpacker and budget accommodation to luxury suites, most with ensuites and some with separate entrances. Each room has tea and coffee-making facilities and there is a fully equipped shared kitchen and an outdoor patio area that opens to the Garden Cottage and outdoor lawn area. New Brighton has a great beach for surfing and swimming (during summer). Located close to the New Brighton Mall, you can walk from Sandy Feet At Brighton to the shops, restaurants, cafés and the Countdown supermarket. The architecturally unique New Brighton Pier and Library are situated on the waterfront opposite. New Brighton offers a relaxed and fun atmosphere and the pier offers expansive views from Banks Peninsula to Kaikoura. The Christchurch City Centre is just a 10min drive away. 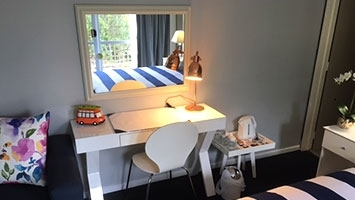 We have a selection of 6 rooms ranging from a Garden Cottage (for the kids or backpackers) to luxurious suites that sleep 3 (queen and single), most with ensuites. With only 6 rooms, and a quiet location, you will enjoy the good night's sleep that you expect in a seaside village. Prices start at $65 per night and go to $165 per night (1-2 people). New Brighton's sandy beach, with good surfing, stretches 18km from the Waimakariri River mouth in the north, to the spit in the south. There is an annual kite flying competition and sand castle competitions. New Brighton's Seaside Market is held every Saturday from 10am to 2pm with a variety of stalls offering handmade crafts, local produce and nice food stalls, held in the pedestrian part of the New Brighton Mall by the New Brighton Project. Swimming with surf-club-supervised areas (summer). Birdwatching at the spit: godwits migrate from this area and their return is something of a local event. Cycling, walking, orienteering – all a favourite. 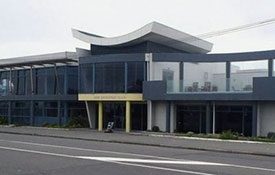 The New Brighton and Districts Museum, located on Hardy Street. Restaurants and art/craft-related shops in growing numbers. 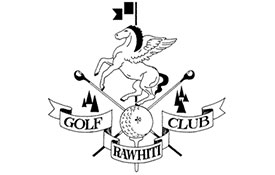 Rawhiti Domain has a Christchurch City Council-run golf links, tennis courts, dog park, rugby fields, cricket ovals, netball courts, community garden, archery club and children's play area. 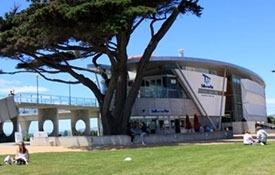 The New Brighton Club provides fantastic facilities right on the beachfront, with a variety of bars, the Pier View Restaurant, Bistro, regular live entertainment, a range of sports groups and clubs, a TAB bar, big-screen TV for sporting events, plus a fabulous function and wedding venue. Salt on the Pier Restaurant is the only restaurant in Christchurch that's on the pier. The spectacular views of the pier and the South Pacific make for a unique, romantic and special dining experience. To complement our venue the professional team at Salt on the Pier pride themselves in ensuring that your dining experience exceeds your highest expectations. Salt on the Pier's restaurant and wine bar provides the perfect atmosphere, be it a romantic dinner for two, a corporate brunch, luncheon, dinner or relaxing in the wine bar. Dine inside or take advantage of the waterfront views of the Pacific Ocean by relaxing on our cosy outdoor deck. 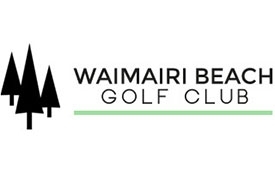 Waimairi Beach Golf Club enjoys a strong reputation as a professional, friendly club welcoming all players of any ability. Members and visitors to the club take advantage of extremely competitive rates, a great course and modern facilities. Grab your golf clubs and head on down to the Waimairi Beach Golf Club to christen one of the newest courses in town and enjoy a challenging yet enjoyable round of golf. Rawhiti Golf Club is located in the seaside suburb of New Brighton. The 18 holes with a distance of 5400m is Par 70 for men and 73 for ladies. The straight tree-lined fairways can look deceptively simple but offer a challenge to golfers of all abilities. The well-turfed (and drained) rolling green fairways ensure pleasant playing conditions all year round. The club was established in 1931 and has a reputation as a friendly club that welcomes affiliates and green fee players alike for a drink and a snack after your game.